Caution - Always replace the failed power supply with the same type of power supply. 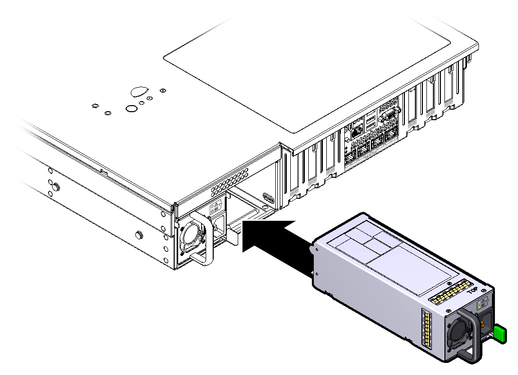 Align the replacement power supply with the empty power supply bay. Slide the power supply into the bay until it is fully seated. Listen for the audible click when the power supply fully seats. Verify that the amber LED on the replaced power supply and the Service Required LEDs are not lit on the front and rear panels. Note - After you have replaced Power Supply 0, you must reset the ILOM service processor (SP) to propagate the FRU top-level indicator (TLI) data to the new power supply. For instructions on resetting the SP, see the Oracle Integrated Lights Out Manager (ILOM) 3.1 Configuration and Maintenance Guide at http://www.oracle.com/goto/ILOM/docs. Power Supply 1 does not contain FRU TLI data, and therefore does not require an SP reset after replacement.